who actually come with solutions. revitalizing the land and water by working with nature. legacy, and what we will face in the future. oil spills, as she came from the Tar Sands region in Alberta Canada. dive into the world of bioremediation. from exposure to harmful toxins. and purifying with the use of microbes and plants. technology, to clean up polluted lakes, water bodies, rivers and estuaries. organic waste to 100% Renewable Natural Gas. 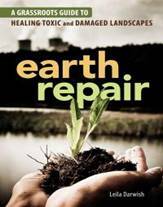 earth repair practitioners working and living in contaminated environments. effectively clean up our environment? wildlife habitat, both above and below the waterline. the most experienced people in this field, please bring your questions! preventing future toxic algal blooms. for two years, developing the new Green Building Rating Tool.